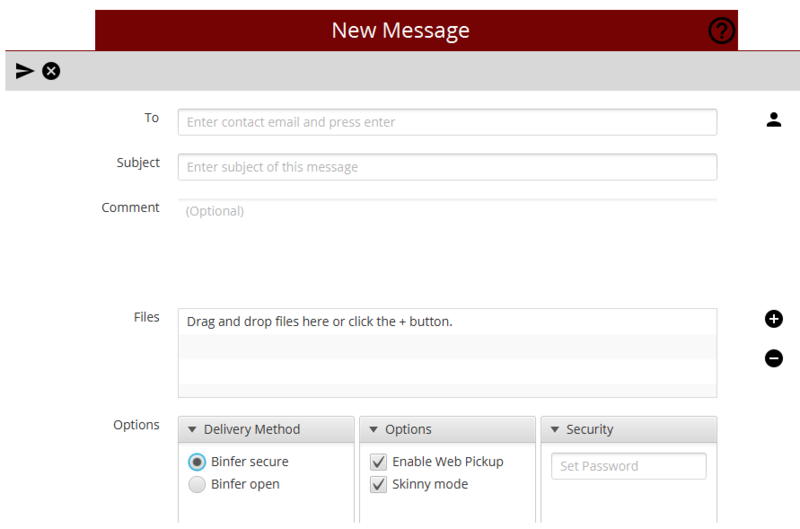 Binfer’s Message feature allows users to send two types of messages; Binfer Secure and Binfer Open. A Secure Message is more secure because the content cannot be read directly by an email client such as Gmail or Outlook. Instead, the recipient must click on the provided link in the email body labeled ‘View Secure Message’; this will open a new window in the recipient’s browser, bridging a direct connection between the sender and receiver, thus revealing the contents of the message. A checkmark on the bottom-left of the message tells you the file has been received. For further details, double click on the message. To Delete the message, simply hover over the message on the left of the screen and press the Red X. You can rest assured that the files are no longer accessible once you’ve deleted it. Tip: If the other party does not have the Binfer app, select ‘Enable Web Pickup’ in the options tab. Recipient’s will receive an email. Upon clicking the link they can download the files.